Can support communications for 72 hours after a disaster. 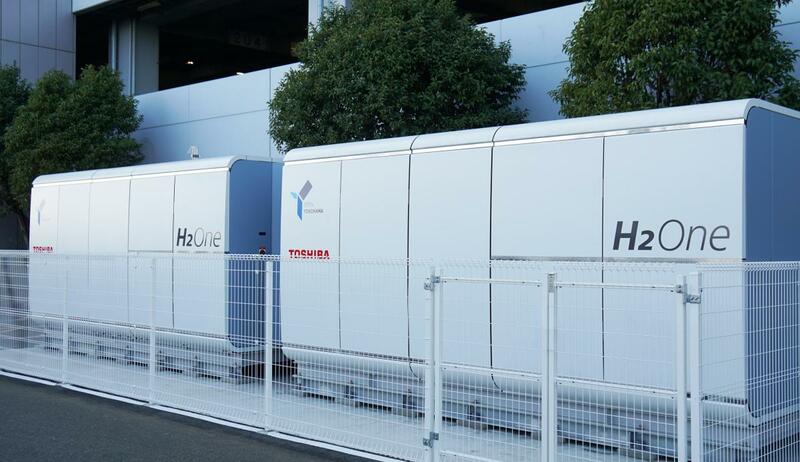 Toshiba Corporation today announced that the first commercial unit of H2One™, the Company’s hydrogen-based autonomous energy supply system, has started operation as an emergency power supply and load management system in Yokohama, Japan. The system has been installed at the Yokohama Cargo Center (YCC) on Daikoku Futo, an artificial island and pier in the Port of Yokohama. H2One™ is a hydrogen-based autonomous energy supply system that integrates a battery for storing electricity, an electrolysis unit for producing hydrogen from water, a hydrogen storage tank and a pure hydrogen fuel cell for generating electricity systm . It silently outputs clean electricity and hot water. The unit at YCC, ordered in October last year and this is the first time has been operated this month as a local government, is a Business Continuity Plan (BCP) H2One™. If a disaster knocks out power supply to Daikoku Futo, the system will convert stored hydrogen to electricity, allowing YCC to maintain communications for as long as 72 hours, and help to secure continuity of port operations. In normal everyday use, H2One’s hydrogen energy management system will support peak shift, which optimizes management of hydrogen production, power generation and storage to reduce demand for mains power at times of high demand. Commenting on the start of operation of the system at YCC, Hiroyuki Ota, General manager, New Energy Solutions Project Team said: “I am sure deployment of the BCP H2One™ at YCC will demonstrate its usefulness not only in emergencies but as a means to manage and reduce mains electricity consumption with a clean, environmentally friendly power solution. We offer four versions of H2One™ for a wide range of applications-the BCP model, a resort model, a remote island model and an Business facilities model . Our goal is to help realize an environmentally clean society where CO2-free electricity from hydrogen is widely used."